Buy works – Brodskaya Lidia Isaakovna | (1910, St Petersburg - 1991, Leningrad). Brodskaya Lidia Isaakovna (1910, St Petersburg - 1991, Leningrad). People’s Artist of the USSR (1980), corresponding member of the Academy of Arts of the USSR (1970), laureate of the I.E.Repin State Prize of the RSFSR, awarded the Silver medal of the Academy of Arts of the USSR (1981). Lidia Brodskaya studied as a non-credit student in the studio of her father Isaak Brodsky at the Leningrad Academy of Arts from 1935 to 1939, and continued her training after 1939 under N. Krymov in Moscow. 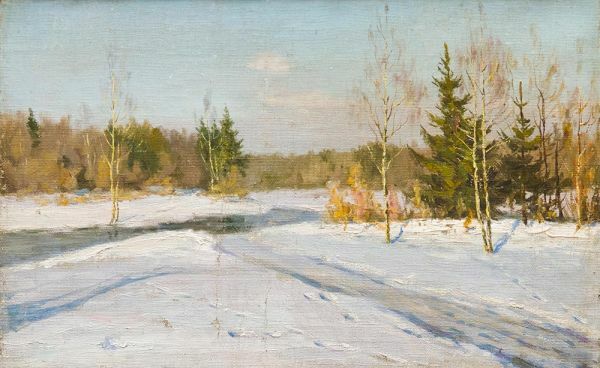 The artist painted landscapes of the Urals, the Ukraine, Siberia and Far East. First exhibited in 1944, Brodskaya participated in exhibitions in France (1948), Finland (1950), Poland (1951), India (1951), China (1954), and Syria (1955). She had her one-woman shows in Moscow in 1948, 1949, and 1955. Lidia Brodskaya’s works are in the State Russian Museum, the State Tretyakov Gallery, in museums in Kiev, L’vov, Chelyabinsk, Astrakhan and other cities in Russia and other CIS countries. Technique: Oil on canvas laid on cardboard.